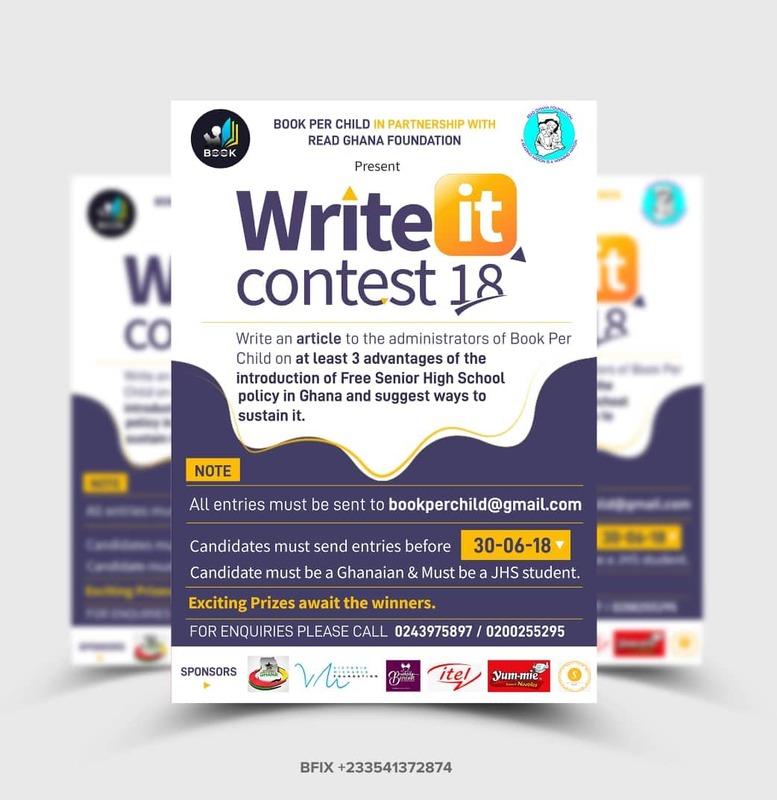 Book Per Child in collaboration with Read Ghana Foundation, a literacy oriented NGO has launched its maiden 2018 “Write It Competition”. This year's topic for the competition is: " Write an article stating at least 3 advantages of the free Senior High School policy in Ghana and suggest ways to sustain it". The article should not be more than 250 words and submitted to bookperchild@gmail.com by the 30th of June, 2018. This competition is for all JHS pupils across the country. It is evident that, education and academic competitions are two of the most important ingredients of every human life. This is heavily supported by humans incessant seeking of knowledge and skills for survival and success. Against this background we can conclude that, education is essentially one of the finest things that makes a human superior. After marking the scripts that will be received across the country, the best 3 pupils will be selected from each region for the final competition in Accra. At the finale in Accra, interesting and amazing prizes will be won by all the finalists especially those who will place from 3rd to 1st out of the 30 participants. Parents must urge the children in JHS to participate in this writing competition because it provides the opportunity for critical thinking and solution-based analysis of national issues. 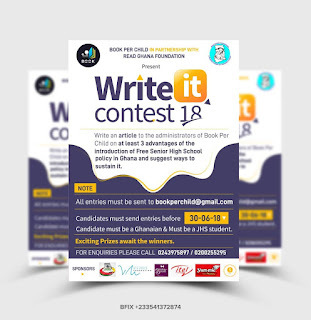 The fact remains that, writers of all ages need an audience and what better way is there to gain one than to enter a writing contest? It’s so satisfying when a child receives a reward for his writings, whether it’s a cash prize, a special gift, or simply a chance to get published nationwide. Writing contests open boundaries for learners because during the process most students need and do a lot of research which broadens knowledge. Writing contests also provide strict limits in the form of deadlines, word count, subject matter and submission procedures. Contest deadlines help them pace their writing so they can develop, write, and proofread the piece with time to spare. Writing contests usually have some sort of word limit. Cutting a story or essay down to its most essential core will result in a tighter composition. Because most contests ask for a specific kind of writing a short fictional story, a patriotic piece, or a poem, for example, students get to fine-tune their skills and focus their writing while practicing with a variety of themes. Writing on a given topic, even if it doesn’t especially interest them, is good practice for future writing assignments. It is our expectation that, most JHS pupils across the country will try their hands on this interesting topic and come up with thought-provoking solutions that can help our educational sector. We will like to thank all the sponsors that have made this contest a reality. We wish all JHS pupils the best of luck in the competition.